Enterprise Information Systems are the most integrated information systems that cut across various organizations as well as various functional areas. Small and medium enterprises, competitor’s behavior, business partner requirement are the identified and established dimensions that affect these systems. Further it has been observed that such enterprise wide software systems prove to be a failure either in the design or its implementation. A number of reasons contribute in the success or failure of such systems. 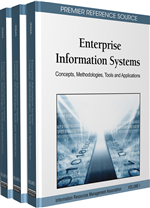 Enterprise information systems inherently present unique risks due to tightly linked interdependencies of business processes, relational databases, and process reengineering, etc. Knowledge of such risks is important in design of system and program management as they contribute to success of overall system. In this chapter an attempt has been made to study the design and implementation risks factors for ERP systems in large scale manufacturing organizations. Based on the model used to study ERP risks and thus the findings, various recommendations have been put forward to suggest a strategy so as to mitigate and manage such risks.